The best jobs in Las Vegas really vary based on your personal career preferences and whether or not you have dreams of working on the strip. Even though most people immediately think of the casinos and entertainment provided in Las Vegas as options for employment, Las Vegas is really just like any other city that provides employment opportunities in fields like healthcare, finance, government, technology and general hospitality. If you're deadset on working in the Las Vegas entertainment industry, keep in mind that jobs on the strip are highly sought after and incredibly competitive. If you want to get a job on the strip, your best bet may be to first gain experience in one of the off-strip hotels and casinos. Once you've proven your worth, see if you can land a gig at one of the larger resorts. If you have a degree and a solid work history, you may be able to get a job in management in one of the casinos. Management positions include everything from food service management and swimming pool management to dealer management and hospitality management at the welcome desk of the hotel. Because so many of the hotels also offer entertainment options, event planners and managers are also highly sought after. 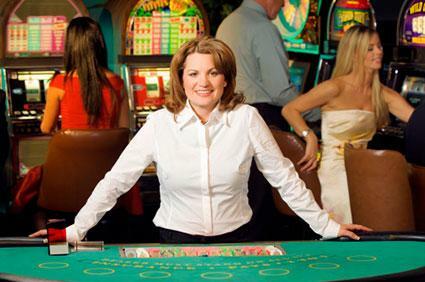 You can also expect to find a number of professional positions in finance and accounting at Las Vegas casinos. With all that money coming and going, casino owners rely on their accountants and financial gurus to keep on top of the books and make sure everything remains legit. If you don't have a degree or you're looking for a part-time gig that's a change of pace from the daily grind, there are a number of tipped positions in Las Vegas casinos that have the potential to rake in the cash. Expect to work your way up from the bottom, first taking the less-lucrative shifts and stations before moving to the times and locations that are known for good tips. Also, don't expect to benefit from a high-roller's generosity immediately. Tipped positions can generally expect to receive solid tips based on fast and friendly service. If you're not meeting high standards of customer service, chances are your tips will suffer. Dealers: Dealers in Las Vegas are highly trained and licensed individuals who earn the money they make in tips. You can deal blackjack, poker or roulette and expect to receive a 10 to 20 percent tip for every individual you deal to. It's not easy to get a dealing job in Las Vegas, and most dealers are hand-picked based on their training, knowledge and displayed experience. If you get a job, you can expect to make anywhere from $40.00 to $200.00 in tips during your shift, on top of your minimum wage. Wait Staff: Las Vegas casinos have a number of restaurants and bars and they rely on friendly and efficient waiters and waitresses to deliver food, drinks and appetizers to their customers. Some wait staff members are hired specifically to work in the restaurants, while others walk the casino floor or deliver room service to the hotel rooms. You can expect to make reasonable tips with a fairly constant barrage of clientele, always ready for their next meal or drink. Valets: Every hotel, casino and restaurant along the strip provides valet service to their guests. Valets need to be fast and friendly, as well as conscientious caretakers of the guests' vehicles. If you don't mind starting with the graveyard shift before working your way into a primetime evening position, you can eventually make a pretty penny while working as a valet. Spa Positions: Most casinos also offer spa services like massage, facials and hair care. Not only can casinos charge a nice sum for these services, you can expect to receive a 15 to 20 percent tip on top of your hourly wage. If you aren't interested in working on the strip, look into positions in Las Vegas that supplement the activities at the casinos. For instance, you can be sure that with all the drinking and gambling taking place in Las Vegas, security, law enforcement and emergency healthcare positions are regularly sought after. And, for all those late-night mishaps and unfortunate drunken marriages, attorneys and legal assistance are a necessary staple in the Las Vegas economy.